I started Embolden in 1998 because I could not resist the window of opportunity to help companies and organizations access the power of the Web to grow their enterprises. I was inspired to make the new technology of the Web accessible and empowering, especially for philanthropic organizations and small businesses. Embolden thrived. In 2014, I sold Embolden to Crown Philanthropic Solutions, a provider of cloud-based donor engagement software, where I joined the executive leadership team. Two years later, the owners of Crown sold the company to RenPSG, North America’s largest independent provider of philanthropic solutions. Throughout the entire journey, a single thread kept my attention. From the very beginning at Embolden, our staff enjoyed spending time with charities and making a difference, or what’s now known as “social impact.” So it was a no-brainer for me to incorporate “doing good” into our business model. Happy staff equals happy clients equals productive workplace equals making more money. It was a natural part of building a successful business. Little did I know, halfway across the country, Laura McKnight was thinking the same thing. In 2012, Laura and her team launched a research initiative to explore the connection between philanthropy and positive psychology. They were curious about the positive effects of charitable giving and other social impact activities on the donors themselves, and how people like you and me can maximize our philanthropy by focusing on the social impact activities we enjoy the most. Over the course of five years, Laura’s experiments and focus groups involving thousands of people yielded a lot of useful data! Her team discovered that each of us has our own “doing good” personality, and each workplace has its own “social impact culture.” Each leans toward one of three types: Investor, Activator, or Connector. This means philanthropy will mean the most if we align our personal and workplace activities with our type. I met Laura when she was CEO of Crown Philanthropic Solutions, on the day I signed the papers to sell Embolden to Crown. When I learned about the Social Impact Personality and Culture Types, everything clicked for me. I really could have used that knowledge at Embolden! When Laura invited me to get involved, I didn’t hesitate. Last summer, we went into business together to build and grow the Social Impact Platform. Today, we’re also working together on the executive team at RenPSG. Here is the big a-ha for Laura and me: Before you or your company can discover its Social Impact Personality or Culture Type, you first need to understand the full range of social impact activities--the 10 Ways to Do Good--and be able to identify those you prefer. Then, you will begin to understand how engaging in combination of your preferred social impact activities will make a positive difference in others’ lives as well as your own. 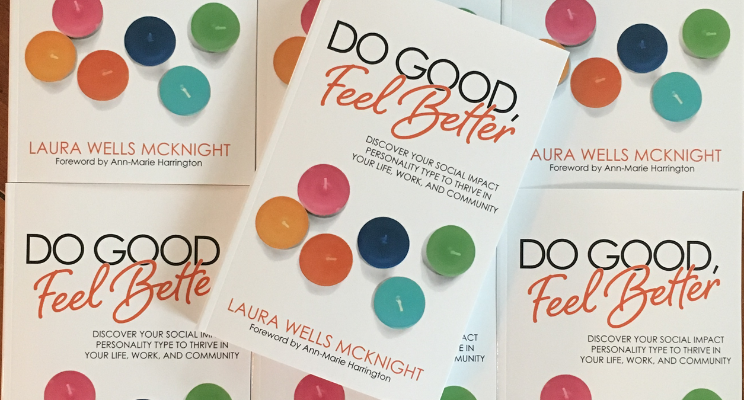 Laura and I are excited for the January release of our book, Do Good, Feel Better: Discover Your Social Impact Personality Type to Thrive in Your Life, Work, and Community. The book is about you. It’s about realizing what truly gets you going when it comes to doing good and, equally as important, just how much good you’re already doing. By learning about the different ways to do good, you’re building on your own success, your company’s success, and the success of your community. Where can you celebrate social impact? Everywhere.